Did you notice anything different around here? I did a little blog-sprucing! No major changes, just some tweaks to the overall appearance and organization, especially since I’m transitioning away from photographing weddings and portraits. Let me know what you think! And one of the ideas I have for the “new” blog is to post a series I’m going to call Tourist at Home. Chris and I are fortunate to live in such close proximity to one of the top tourist destinations in the country, and yet we don’t take advantage of that opportunity often enough! But, as all you smart cookies already guessed from the title of this new blog series, I’m about to change that. I’ve certainly spent a good amount of time in DC photographing engagement sessions and weddings, but in my new found spare time I’m going to make it a priority to get out and see/do more of the local touristy stuff. 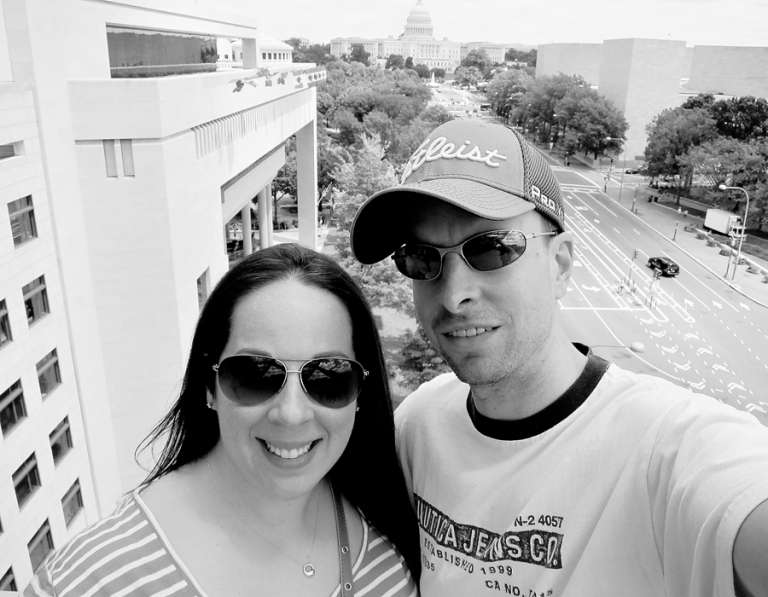 So to kick it off, Chris and I visited the Newseum in DC this past Memorial Day weekend. We went on Saturday when it was absolutely gorgeous out, and we didn’t find it to be too crowded at all. The adult admission ticket price was $22.95 each (and then we received a 10% discount for my AAA membership), which includes two consecutive days, so if you don’t have time to see everything you want to you can return the following day. And I can understand how you might want two days to see/read everything – this place is huge with fifteen galleries, fifteen theaters, and multiple interactive stations throughout that span seven levels. The enormity of the space probably also helps with crowd management since there’s plenty of room to spread out. Signs on the entry floor direct you to begin your self-guided tour on the Concourse level below where you can watch a short orientation video about the museum. 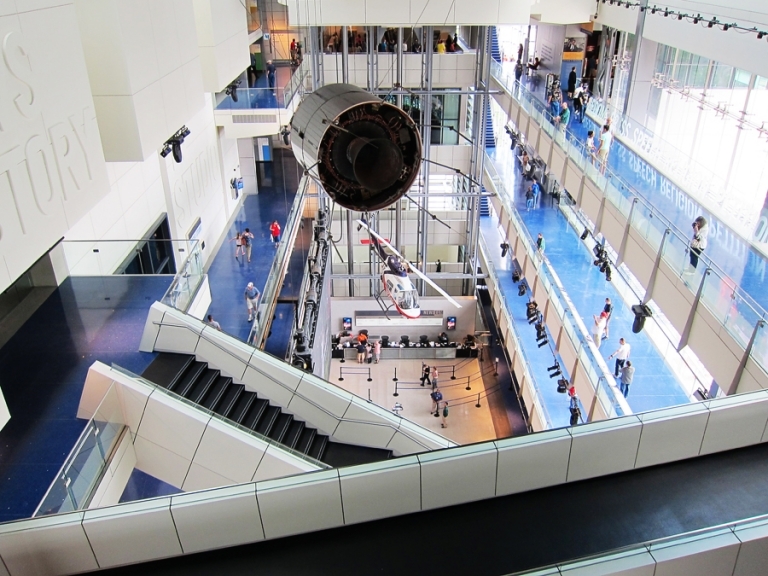 The suggested tour order is to start from the 6th floor and work your way back down, accessible by a big glass elevator, a regular elevator or stairs. 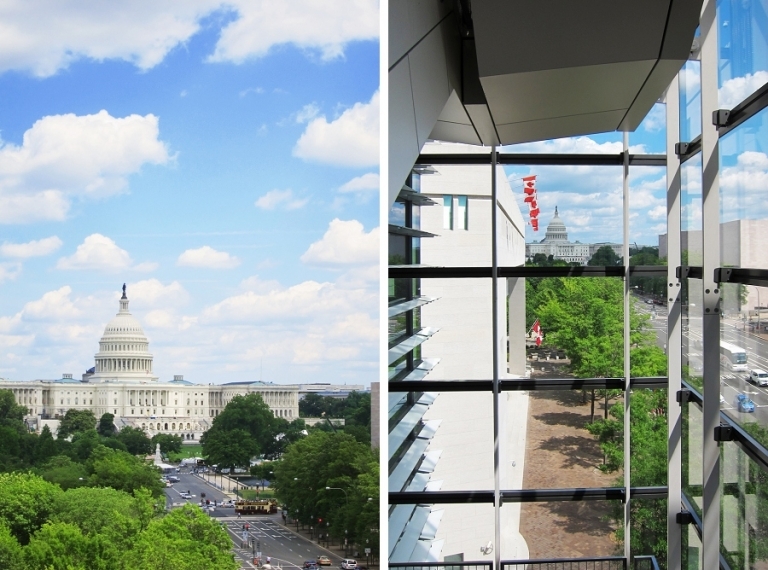 We followed the suggestion and went up to the top where an observation deck offers a beautiful unobstructed view of the Capitol and Pennsylvania Avenue. It’s also a good selfie photo op. 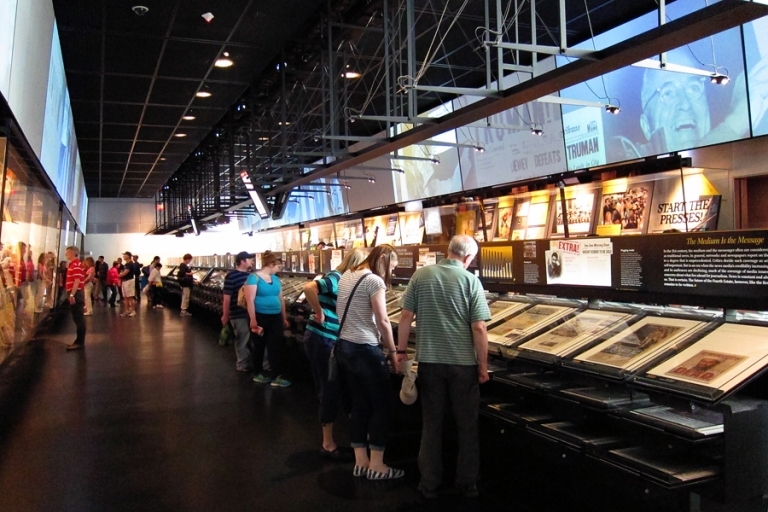 Our favorite feature of the whole museum was the News Corp. News History Gallery with over 300 newspaper front pages with historic headlines. We spent a lot of time in here inspecting articles and appreciating not only the historic significance of the news, but noticing the changes in layout, typeface, and jargon over the years. I love that non-flash photography is allowed in about 95% of the museum, so I was able to take a few snapshots of my favorite front pages. The most harrowing display in the museum for me was definitely the 9/11 Gallery on the fourth floor, which consists of a documentary theater room, a front pages display, a beautiful remembrance slideshow of quotes projected onto the wall, and artifacts from the attacks including the damaged antenna from the North Tower of the World Trade Center. We didn’t spend much time there solely on my account – it’s still too difficult for me to think about that day and I choked up immediately, so we’ll need to go back someday and spend more time on it. I cheered up at the New Media Gallery where we started by taking a photo at the Check-In kiosk. Visitors’ photos get displayed on the big screen TVs overhead. (Note: I additionally selected the “email me my photo” option, but sadly the photo never arrived in my inbox – I think there might’ve been a glitch.) You can also take a turn at the Game Zone and play a motion-sensor trivia game called “Dunk the Anchor.” The second floor also offered lots of playful interactive opportunities – we saw kids stepping in front of cameras to be magically transformed into on-air reporters, and I took a turn at the news anchor desk for a very smiley photo op. I am apparently reporting happy news in the photo below. We ended our tour with the 4-D movie, “I-Witness!” on Level 1. We didn’t have a movie schedule handy so I’m not sure how often it runs, but we sat in a waiting area for about 10 minutes, and then once we were seated in the theater it was about a 15-minute presentation with seat movement and gusts of wind. I imagine this would feel awesome on a really hot summer day! The movie is a little silly and the seat movement effects seemed oddly placed, but it was interesting enough. It’s also a great time to take an unflattering awesome photo of yourself in 3-D glasses. Our tour took about three hours, but you can easily spend an entire day (or both days) here if you read all of the placards, watch all of the films, and participate in all of the interactive features. I’m not a parent, so please take this with a grain of salt, but I doubt that kids younger than middle school age would be entertained here for very long. I can’t recall seeing even anyone under 12 the whole time we were there. We saw a couple of field trip groups of middle school kids and high-schoolers, and I think that’s probably the age where kids would start to appreciate the Newseum. Overall, this was a fun and really informative way to spend an afternoon in DC! 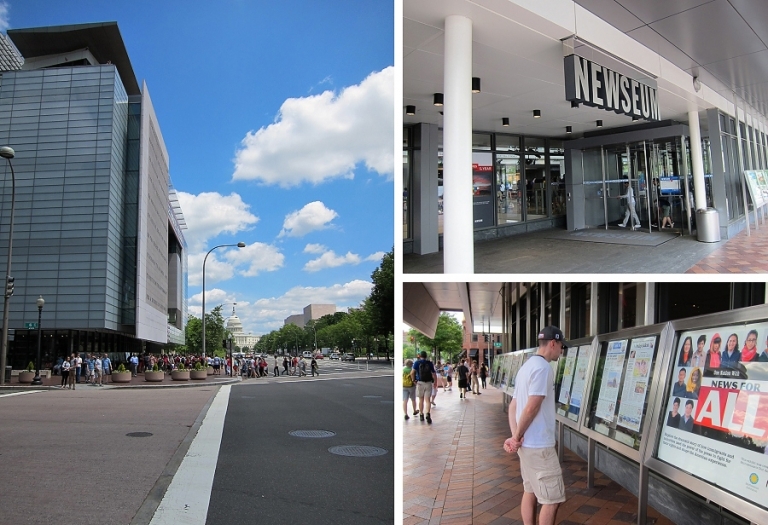 The Newseum easily deserves a spot in my Top 10 DC favorite attractions, and I’d highly recommend it to anyone interested in the history of the news and a few hours to spend, especially on a hot or rainy day. Let me know if you have any questions, or if you have ideas for a future Tourist at Home post!